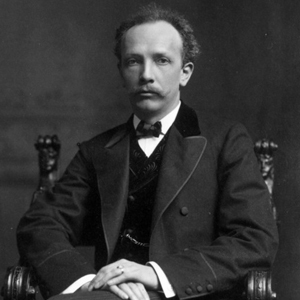 Richard Strauss was born in Munich on June 11, 1864, the son of Franz Strauss, first horn in the court orchestra there. He had his first piano lessons at the age of four and began violin studies four years after that; another invaluable part of his apprenticeship was being able to sit in on the rehearsals of the orchestra in which his father played. Strauss’ first efforts in composition were made as early as 1870, so that by the time he entered the Royal Grammar School, the Ludwigs-Gymnasium, in 1874, he was already a practiced composer. Strauss enjoyed many performances of his works in the seven years of his classical education there. His first orchestral work, completed in 1877, was a Serenade in G major, dedicated to his teacher, Frierich Wilhelm Mayer; his first symphony, in D minor, followed in 1881, contemporaneously with a string quartet in A major and a Festive March, his "official" Op. 1. In 1886, Strauss left the Meiningen Orchestra to take up the post of third conductor at the Munich Opera Orchestra. A visit to Italy that year provided him with the inspiration for his “symphonic fantasy” Aus Italien, premiered the following year; but it was Don Juan, written in 1888 and first performed in 1889, that provided him with his real breakthrough: he was instantly hailed as the most important and forward-looking German composer since Wagner. Strauss’s daily bread was earned in the opera house, so it was not going to be long before he tried to compose a stage work himself. His first attempt, Guntram (1894), flopped, but the second, Feuersnot (1898), was received with enthusiasm on its first production, in Dresden in 1901. Strauss was now an internationally acclaimed figure, both as composer and conductor: he gave the first performance of the Sinfonia domestica, for example, in 1904, in New York on a visit to the USA. The vociferously applauded premiere of his third opera, Salome, in Dresden in 1905 set the seal on his standing as one of the most important living composers. Strauss meantime was garnering honor as a conductor, leading to his appointment in 1919 as a joint director (with Franz Schalk) of the Vienna State Opera, although he was forced to resign the post in 1924 after differences with Schalk and the Austrian government. His next opera, Intermezzo (this time to his own libretto), was premiered in Dresden in the same year. The collaboration with Hoffsmansthal continued with Die ägyptische Helene (1927), but the poet’s untimely death in 1929 left the libretto of Arabella unfinished; in 1932 Strauss completed it in his memory. With the Nazis’ seizure of power in 1933, the most troubled period of Strauss’s life began. Unwisely, perhaps, he conducted Parsifal at the Bayreuth Festival after Toscanini withdrew in protest and accepted the position of president of the Reichsmusikkammer (though he was not consulted beforehand), but he stuck stubbornly to his collaboration with his new, Jewish, librettist, Stefan Zweig, a position that gradually cost him his position of favor with the new regime. Die schweigsame Frau, their first collaboration, was allowed its premiere in Dresden in 1935, but the rest of the run was cancelled—whereas Daphne and Friedenstag, both with librettos with Joseph Gregor, went ahead unhindered in 1938. Strauss was sure that his next opera, Die Liebe der Danae, would be his last and he lavished all his mastery on this radiant score, completed in 1940. But as work on Die Liebe der Danae came to a close, he now began work on a libretto by the conductor Clemens Krauss; this was to become Capriccio, the premiere of which Krauss conducted in 1942. In 1943, Strauss composed his Second Horn Concerto, which ushered in a remarkable Indian summer of gentle autumnal masterpieces: Metamorphosen for 23 solo strings, written as an elegy for the destruction of the Germany Strauss loved; two Sonatinas for wind instruments; the Oboe Concerto and Duett-Concertino for clarinet, bassoon and orchestra; and the “Four Last Songs,” perhaps the best-loved orchestral songs by any composer. Strauss was still active as a conductor for his own 85th-birthday celebrations, but after a series of heart attacks he died peacefully at home on September 8, 1949.